Aves nutritional value in animal fodder products. The proteins in Aves products are of vegetable and animal origin and have a high biological value. Where needed synthetic amino acids have been added to the feed to increase the nutritional value of the total protein content. When it concerns bird feed, quality and digestibility of the proteins are of importance. When analysing the protein, its quality is assessed for about twelve essential amino acids, namely arginine, histidine, isoleucine, leucine, lysine, methionine, cystine, fenylalanine, tyrosine, threonine, tryptofaan and valine. Carbohydrates in Aves fodder are easy digestible and do not contain NSP (non-starch-polysaccharides). Depending on the type of product, like premix, vitamin/trace element preparation or a complete feed, the following vitamins, minerals and trace elements have been added: vitamin A, D3 (cholecalciferol), E (dl-tocopheryl acetate), K3 (menaphthone), B1 (thiamine), B2 (riboflavine), B6 (pyridoxine), B12 (cyanocobalamine), biotin (H), choline, folic acid (Bc), nicotinic acid (PP), pantotheenzuur (B3) and vitamin C (ascorbic acid); Na (sodium), Cl (chlorine), Ca (calcium), P (phosphorus), K (potassium), Mg (magnesium), Fe (iron), Zn (zinc), Mn (manganese), Cu (Copper), J (iodine), Co (cobalt), Se (selenium) and Mo (molybdenum). The nutritional value of Aves fodder is of such standard that it exactly sees to the nutritional needs of your bird or reptile. Thus no more or less than exactly required. It is advised against adding other products to Aves fodder. It is an excellent way to improve the nutritional value of fodder insects. Contains the right amount of calcium with a ‘high biological’ value. Contains calcium and phosphorus in the ideal proportion. Contains all vitamins, minerals and trace elements. Is safe to use due to the absence of antibiotics, prophylactic medication and preservation compounds. An excellent way to significantly increase the nutritional value of the mealworms! Aves mealworm fodder gives mealworms the required amounts of extra calcium, vitamins and trace elements. The product has a very low iron content to avoid Hemochromatosis among fruit eating birds. Mealworms fed with Aves-Mealworm fodder contain the right amount of calcium (0,8%) and phosphorus (0,3%) in the most optimum proportion. Moreover they contain all, for birds and reptiles, required vitamins, minerals and track elements. 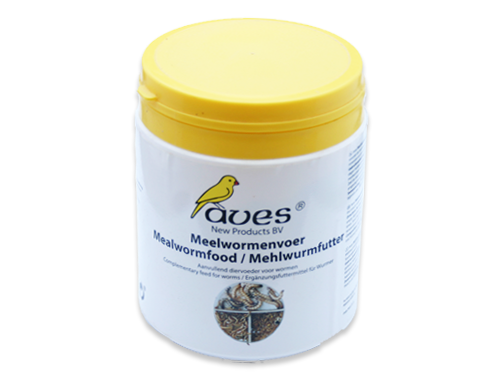 Aves mealworm fodder can best be supplied to mealworms which have fasted 2 days as a result of which they have an empty digestive tract. Then, for 1 day Aves-mealworm is supplied. The remainder fodder, obtained after sieving the mealworms, hardly contains any mealworm manure and can therefore be reused many more times. The fodder comes in a re-sealable round jar. Insect sprinkle powder offers an excellent way to improve the feeding value of the insects! Aves insect sprinkle powder provides fodder insects with the required quantities extra calcium and with all the essential vitamins, minerals and trace. Elements. The product has a very low iron contents to avoid Hemochromatosis among fruit eating birds. Aves sprinkle powder is used to sprinkle fodder insects before they are used as fodder. The nutritional value of the powder is such that it takes into account deficiencies in nutrient in the fodder insects. The dosage is 4 gram powder per 100 gram fodder insects. The powder has an ultrafine structure to ensure maximum adherence to the insects. Before sprinkling the insects have to be slightly moistened. This can be done by using a plant spray bottle. The sprinkle powder comes in a well re-sealable jar. Add 1 measure of Aves AqueRep to 50 ml lukewarm water and dissolve with the help of a fork. Lightly spray plants and terrarium material with water. The water drops will be licked up by the terrarium animals. Spray the plants after several hours with normal water to remove the rest of the AquaRep. Most of the terrarium animals prefer to drink spray water over water from a drinking tray. By using Aves-AquaRep, vitamin A, D3 and calcium deficiencies can be prevented. When deficiency symptoms occur Aves AquaRep can be supplied with a pipette. If you are interested in this product please sent us an email.